London Marathon Bus – All aboard Ian’s bus! There are some spare seats going on the bus up to London, which are now available for external runners or supporters. The bus shall be leaving the Sandhurst Library at 06:30 to get to Greenwich, and will be heading home from Pall Mall at 16:30. SJ Annual Ball 2019 – Get on your dancing shoes! The last few tickets are still available for the SJ Ball, this year being held on Friday 29th March at Easthampstead Park Conference Centre. Dress to impress, it should be a great night! Tickets are £35, so please email Lisa Harold (social@sandhurstjoggers.org.uk) to book your place. Bracknell: 7 SJs took on Bracknell, with Martin Steadman heading up the list with a good time of 23:02 and a 17th place overall finish to go along with it. Jane Bannister was the first female SJ and 14th overall, as well as first in her age category with her time of 27:30. Frimley: With the highest SJ turnout of the weekend, Frimley saw Clive Rolfe come 8th overall with a great time of 19:37, leading the SJs in. Janet Venables was the first female SJ down the finishing tunnel with a time of 27:53. Meanwhile, with a time of 31:00, Jonathon Taylor took almost 5 minutes off his previous Frimley PB, so big congratulations are in order! Rushmoor: Those seeking a flatter start to their Saturday headed to Queens Avenue. Lisa Hale came through as the 6th overall female and was the first SJ to come home, with a good time of 24:27. Graham Bolton was the first male SJ in, with a time of 26:58. Meanwhile, Dave Bartlett was kept on a short lead at all times, as per Parkrun rules, by Lina Johnson and Nigel Evans, with the three SJs coming in at the 31:47 mark. Rumour has it he kept trying to pick up sticks with his mouth on the way around, then rolled in a puddle to cool off afterwards! A great run by Dave, all to raise awareness for his London Landmarks Half Marathon, taking place next Sunday. Well done Dave! California Country Park: The charm of California bought 6 SJs in for its 4th event, 4 of whom were giving it their first run. Craig Bowles was the first SJ and 12th overall with a time of 21:10, whilst Louise Gubb was 6th overall female with a time of 24:18. Tourism: As usual, plenty of SJs ventured out to some different parkruns this weekend. Teresa Milroy and Colin Carpenter fancied a hilly one at Alice Holt, although it was their first time so we’ll see if they will be back for more! Royston Crandley, George Green, Sam Weller and Elin Loftesnes took to the lakes of Dinton Pastures, Monica Burbidge was in Guildford, John Wright gave Winchester a go for the first time, and the St Aubyn duo of Charlie and Charlotte tried Maidenhead for the first time. Slightly further from home, Sharon Conquer took on Northampton, the two Stuarts (Overhill and Mayes) headed to Brooklands, Andy Sumerskill was at Houghton Hall and Yvette Glacken went well at Luton Wardown. Finally, we had some great efforts in the Parkrun tourist department, as John Tovell took on Crane Park for a pre St Patrick’s Day Parkrun (personally I’d be expecting a free Guinness at the end), whilst Kate Parker continued her tour of Singapore parkruns, coming through as 8th female at Bishan! Richmond Spring Riverside 10k – Alison Jones and Sarah Jones were out running what looked like a pleasant event along the Thames on Saturday! Saturn Running’s Doh’Nut Run at Thames Valley Park, Reading – Michelle Wilson took on the latest Saturn event, and hopefully treated herself to a doughnut or two afterwards! Well done to those SJs out running Saturday events this weekend! Reading Half Marathon: A good number of SJs set off from Green Park on Sunday for the Reading half. Finishing off at the Madjeski, in a much better atmosphere than a Reading matchday, Robert Jerrett charged round in a great time of 1:26:55 (chip time). Tracy Robinson was the first female SJ in, with a superb time of 1:46:10! 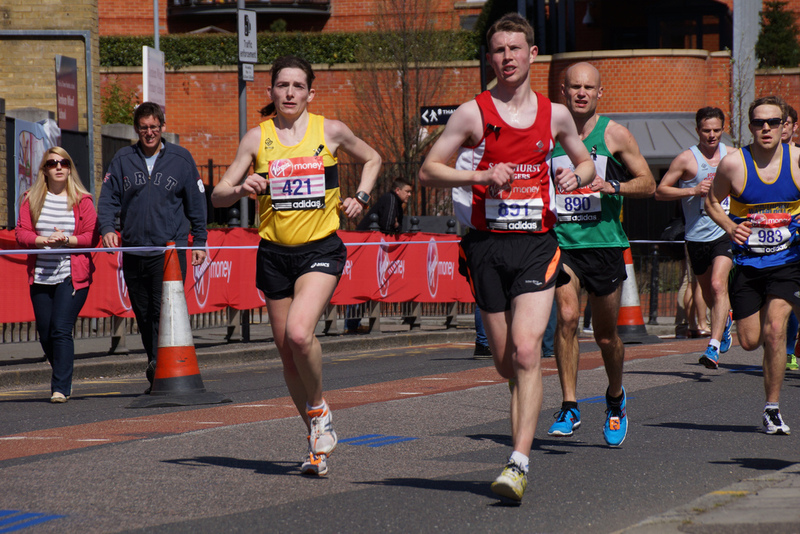 Fleet Half Marathon: Another popular event with SJs, Mark Pattrick led home with a time of 1:34:02, with Kirsty Kent taking the first female SJ finish with a time of 1:45:52. Well done to all SJs in running Reading and Fleet, we’ll have a more detailed round-up of each event later on in the week…. Thursday: Erol looks to continue his fine record of going 2 straight weeks without losing anyone as newly appointed run leader on the threshold/improvers run. Meet at Sandhurst Sports Centre at 7:30pm and don’t forget lights and high vis clothing. The run is a great way to improve fitness by running as a group at a slightly harder intensity. There is a shorter route available and a sweeper so nobody gets left behind. That’s a wrap for this weeks run down! This is my first run down, so please bear with me as I learn the ropes, any feedback is always appreciated! All that’s left for me to say is have a great week, and in the (amended for effect) words of Bruce Forsyth and Tess Daly, keep running!